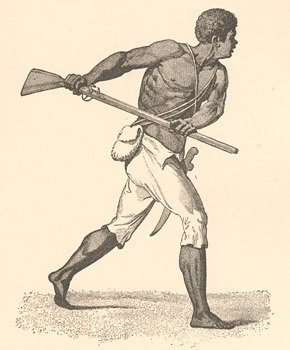 Maroon Captain Leonard Parkinson, a warrior of Jamaica, from the 1796 engraving by Raimback. Engraving from Winsor's Narrative and Critical History of America (1884-89), originally published in The proceedings of the Governor and Assembly of Jamaica in regard to the Maroon Negroes (1796). From 1775-81, Lord Dunmore's proclamation and the general wartime chaos led to a great influx of blacks into Florida, which was the only colony that remained under British control throughout the Revolution. In 1782, the situation changed when the Americans finally won the war. Most of the black British loyalists left the region, traveling with their new allies to Canada or the West Indies. Yet life in Florida remained inviting for many black fugitives. Spain was about to regain the colony (as a reward from the U.S. for neutrality during the Revolution), and many blacks expected lenient treatment at Spanish hands. As a result, in 1782 hundreds chose to remain in Florida, awaiting the return of Spanish rule, forming communities in the wilderness, and continuing to develop ties with Seminole Indians.